Sometimes long weekends can make the best vacations. Since me and Soko retired two years ago, our life has become one long weekend. But if we want to go on vacation with our friends and family we have to wait until they have vacation days or a long holiday weekend off. My sister, Sandie, had a four day weekend because the pre-school she works at was closed for Rosh Hashanah. 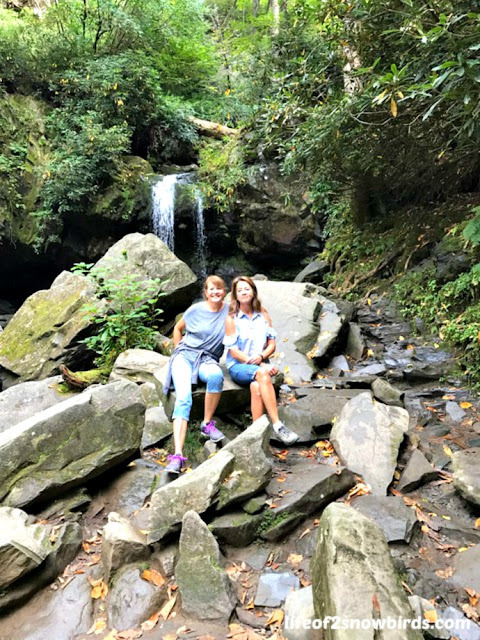 She wanted to make the most of it so she invited me and Soko to go hiking in the Great Smoky Mountains with her and her husband, Mini. So they headed 12 hours southwest and we headed 7 hours west and we met in Gatlinburg, TN at the Holiday Inn Express Gatlinburg Downtown. Me and Soko actually drove through the Great Smoky Moutains to get there, entering in Cherokee, NC and exiting in Gatlinburg. On our way through, we stopped at the Sugarlands Visitors Center and picked up a hiking map and information about the mountains. When we met up with Sandie and Mini we looked through the information to figure out which trails we wanted to do. The trails were rated from easy to strenuous. And they were categorized by the main description of the hike. 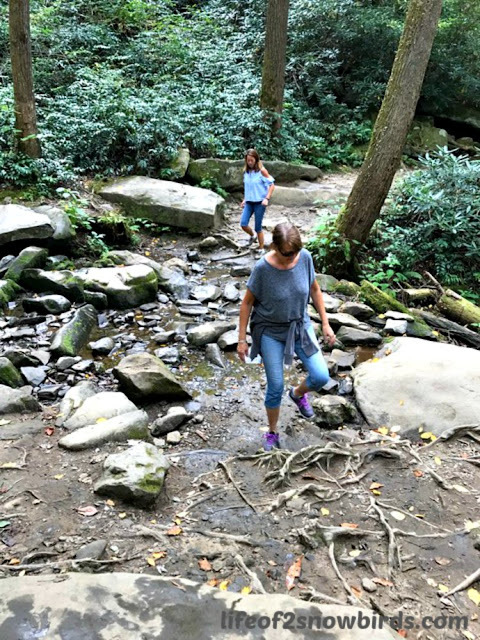 We could choose from loop hikes, hikes with views, waterfall walks, hikes to old-growth forests or pleasant strolls and riverside rambles. We also looked over the potential hazards. We read that we should avoid any snakes we see as two species of poisonous snakes live in the Smokies. We did see a snake that Mini said was only a garter snake but we kept as far away from it as we could anyway. And luckily we didn't see a bear, but we knew if we did see one we were not supposed to turn our backs to it. We were supposed to act aggressively and try to intimidate the bear by talking loudly or shouting at it. I'm pretty sure that my reaction would have been to turn my back to it and run which is totally the most unsafe thing to do according to the article. I'm really glad we did not see a bear! 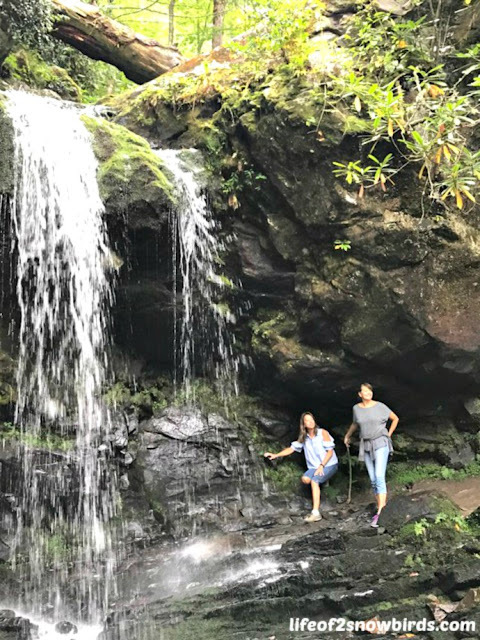 For our Day 1 hike, we decided to do a trail that was rated moderate and led to a waterfall. 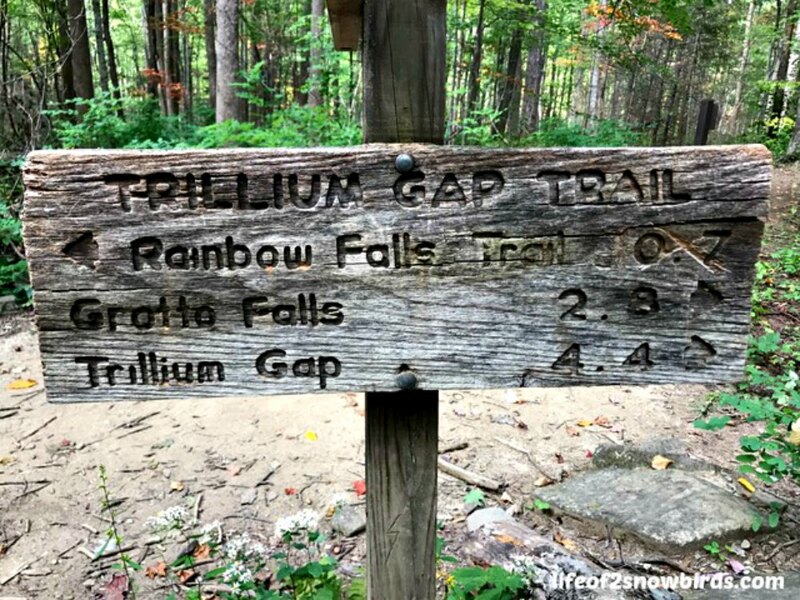 We drove our car into the mountains until we found Trillium Gap Trail. This would lead us to Grotto Falls. There were lots of roots that we tried to maneuver around but there were so many roots, especially as we got nearer to the falls, that we had to walk on top of them, very carefully. There were also streams with lots of rocks to climb on that tested our balance. The rocks were pretty dry though or they would have been slippery and harder to get across. We took our time and took breaks when we needed to catch our breaths. We were treated to a beautiful site at the end of the 3 mile trail. We were able to walk under the falls and the mist from it was very refreshing. We sat and enjoyed the view for awhile before we headed down the trail. What I learned from this hike was how much easier it was to get across the very rocky streams and root filled parts of the trail after I picked up a stick to use as a hiking pole. It really helped me to keep my balance and not fall at those tricky areas. We were passing people all day who were using some kind of stick or pole, either singularly or as a pair. I will look into getting a trekking pole before my next hike. I researched a bit and saw that they have ones that fold and can be carried in a backpack. I ditched my stick when the path got clearer because I got tired of carrying it so the folding stick will work perfectly for me. 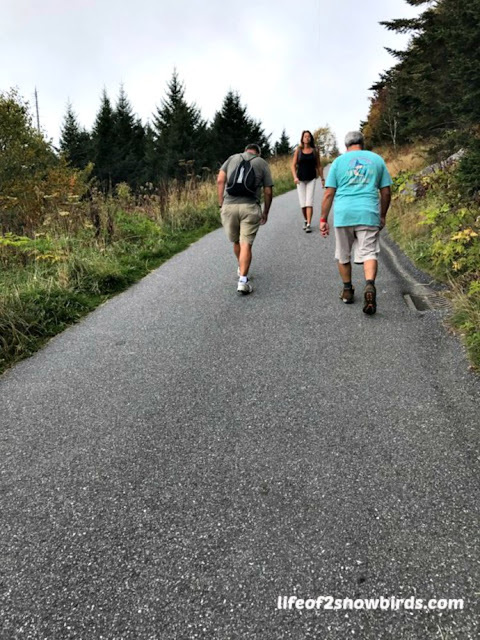 Besides for helping with balance, you can use your pole to help you on steep inclines and declines and they also take some weight off your knees. For our Day 2 hike, we chose a hike rated moderate with a view. 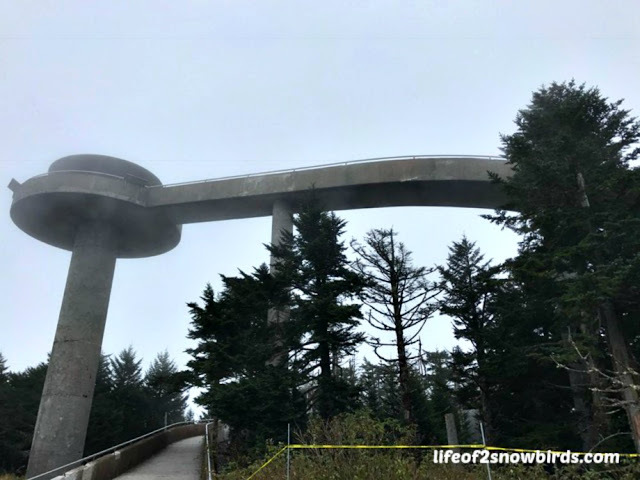 So off to Clingmans Dome Tower Trail we went. This was a much shorter trail, 1 mile, and it was also on a paved road so sounded easier than our Day 1 hike. We were warned, though, that the trail was very steep. They were not kidding about the steepness of the trail. Now we knew why the trail was rated moderate and not easy. We (I should say "I") had to make lots of stops to catch our breath. It was disappointing that we when we finally made it up that mega steep trail we found out that the tower was closed. It would have been fun to go up there to see the view, but it was really foggy that day so we probably wouldn't have been able to see much anyway. We got over our disappointment quickly when we saw the Appalachian Trail sign. 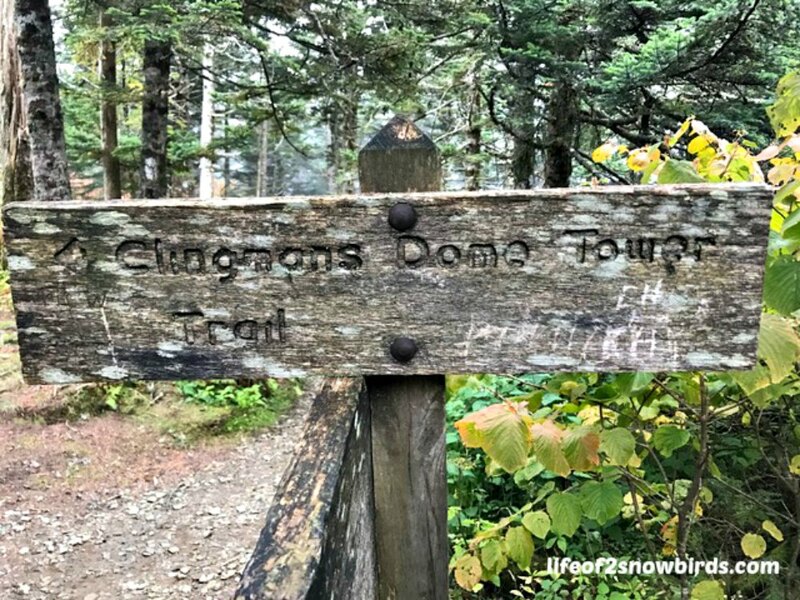 Clingmans Dome is actually the highest point of the Appalachian Trail at 6,643 feet. Now I get why the trail was so steep! 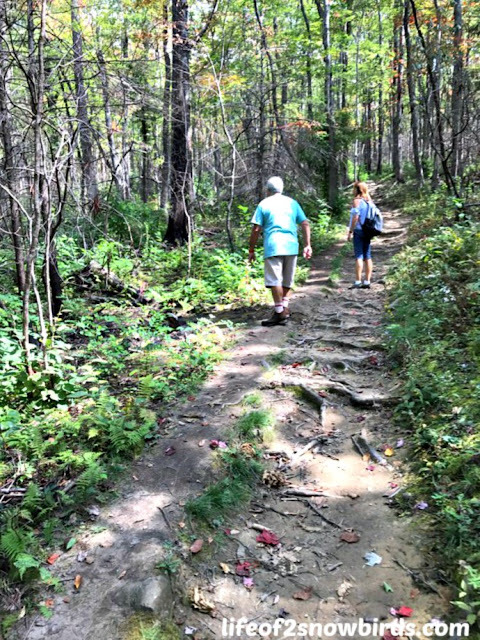 We decided to hike the Appalacian Trail since it was right there but only went a few feet in and back out again. 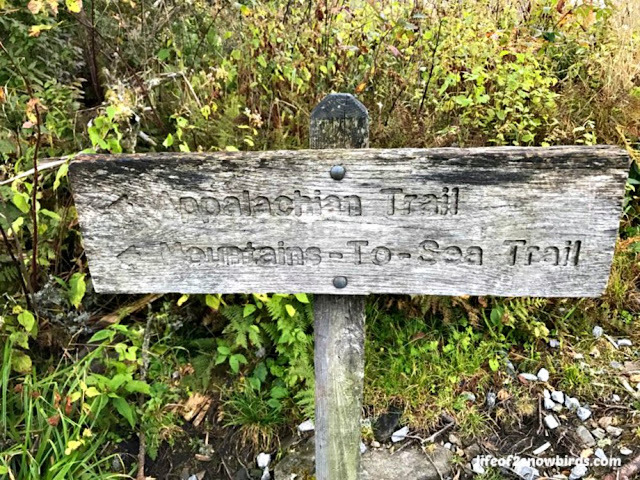 We would have to be a little more prepared than we were to hike the longest hiking-only trail in the world. 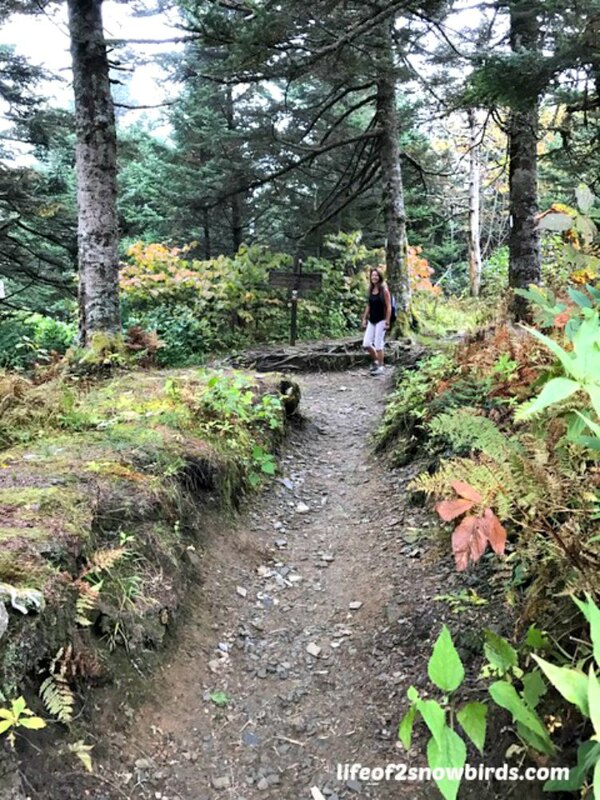 I don't think the Appalacian Trail will ever make my "Must Hike" list. 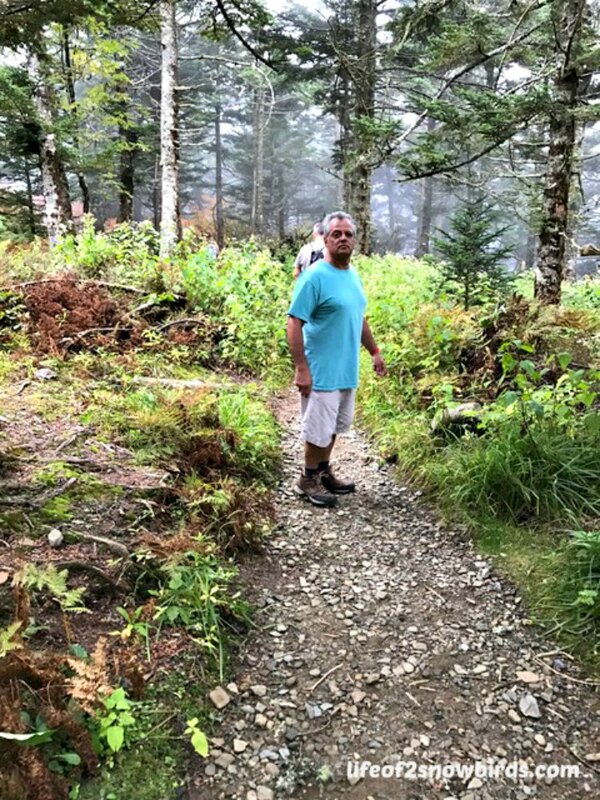 Hiking 2,200 miles and through 14 states is a little too much hiking for me. What I learned from hiking the very steep Clingmans Dome Trail is that I was not wearing the right shoes at all. My toes were killing me after smashing into the top of my sneakers as we made our way back down the trail. This made the decline much harder for me than the incline. Before my next hike I will get some hiking boots. I have started to do some research into finding the best boot for the kind of hiking we will be doing. What I definitely know is that I will make sure that I get boots that fit properly. I read that I should be able to fit my finger between my heal and the back of the boot. This assures that there will be plenty of room for your toes not to hit the front of the shoe. Also, ankle support and sole rigidity is important. There are many choices of materials used to make the boot that will give you more or less support but will also make the boot heavier or lighter. The article I read suggested a combination of nylon mesh and leather. We had a great time with Sandie and Mini enjoying the great outdoors together. 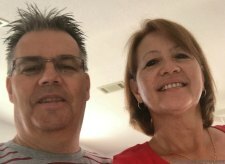 We made plans with them to see and hike as many National Parks as we can once they retire. That gives me about 5 years to find the perfect trekking pole and pair of boots! You will never run out of beautiful hikes to take in the GSMNP! It's beautiful all throughout the year! You're right. We only had time to do two and it was so hard to choose which ones to do! 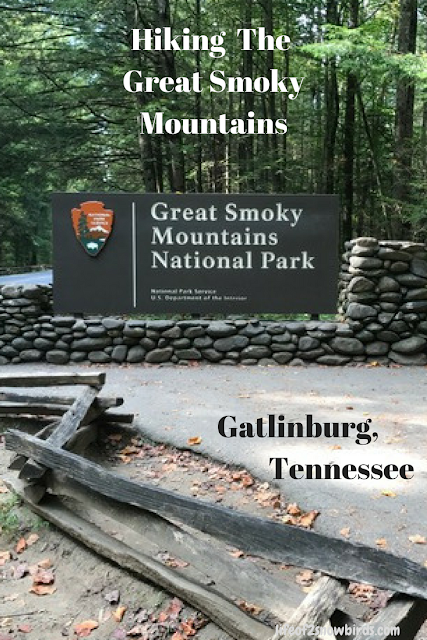 I have never hiked in the Great Smoky Mountains, but I definitely want to go there one of these days. Thanks for sharing your trip photos with us at the #HomeMattersParty this week. Hope you get a chance to go! I've heard this hike is great! Thanks for sharing this in the To Grandma's House We Go Link Party! It has been pinned. Remember to follow all of us and we hope to see you back this Wednesday! I fell in love with the Smoky Mountains. I just got back, and I'm already planning my trip next year. I may try to hike a few trails. Thanks for sharing on Sunday's Best. I hope you get a chance to go hiking in the mountains when you go back next year!